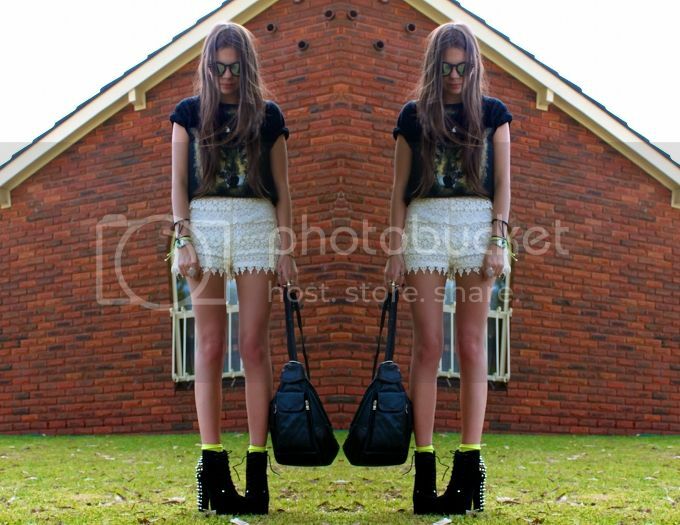 wearing: Tee - Someday Lovin, shorts - Lola vs Harper, Shoes - WILD DOLL, Socks - Rubi, Backpack - vintage, sunnies - MHQ and vintage necklace. I wore this outfit to uni this week minus the heels which I had to put on as soon as they arrived on my doorstep! You guys will know by now that I am a boot girl through and through. Throw in a platform and spikes and I'm sold-diddly-old. Today was so so lovely and warm that I spent pretty much the whole day re-reading my way through The Hobbit in the sunshine. Then, obviously, had afternoon tea and cheese to finish it off. Yum!!! Love the neon socks against the black shoes with studs; looks great! I love your style and you are such an inspiration. I absolutely love this, especially the shoes! this is such a cool look! I love the socks! your sunglasses are awesome! I like your blog so much!